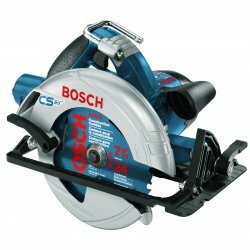 The Bosch™ HD5860 8-1/4" Worm Drive Circular Saw is the perfect saw for an all-around carpenter. Its precision-machine worm drive gears for maximum power and durability and its oil indicator level and relief bellows ensure long life. The die cast aluminum motor and gear housings establish a durable design. The Bosch™ HD5860 is designed to be tough, powerful and long lasting. Dimensions: 8" x 9" x 21.2"